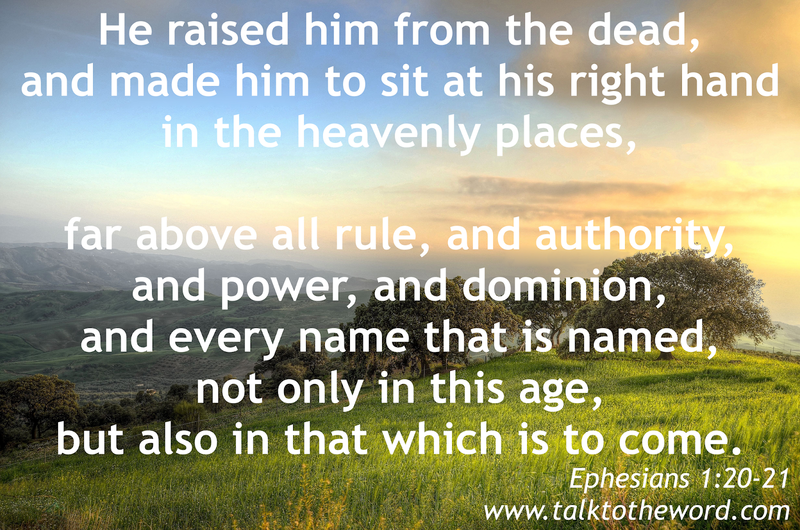 raised him from the dead, and made him to sit at his right hand in the heavenly places, far above all rule, and authority, and power, and dominion, and every name that is named, not only in this age, but also in that which is to come. Ephesians 1:20-21. Ephesians 1 [15.] For this cause I also, having heard of the faith in the Lord Jesus which is among you, and the love which you have toward all the saints, don’t cease to give thanks for you, making mention of you in my prayers, that the God of our Lord Jesus Christ, the Father of glory, may give to you a spirit of wisdom and revelation in the knowledge of him; having the eyes of your hearts[a] enlightened, that you may know what is the hope of his calling, and what are the riches of the glory of his inheritance in the saints, and what is the exceeding greatness of his power toward us who believe, according to that working of the strength of his might which he worked in Christ, when he raised him from the dead, and made him to sit at his right hand in the heavenly places, far above all rule, and authority, and power, and dominion, and every name that is named, not only in this age, but also in that which is to come. Ephesians 1 [22.] He put all things in subjection under his feet, and gave him to be head over all things for the assembly, which is his body, the fullness of him who fills all in all. a. Ephesians 1:18 TR reads “understanding” instead of “hearts”.